Ugly fashion like Crazy - Make up inspired a great movie is not only about the storyline but also how cool the picture is. In this techy century, most of movies were produced with a touch of computers. CGI or Computer-Generated Imagery, or we can simply call it a scene in a movie made by special effect of computers. How far CGI included in a movie? You can see in almost of science fiction or fiction movie, and CGI finished the late Paul Walker scene after he got an accident before the movie Fast and Furious had done. Do movie maker always rely on CGI? Nope, some of them also make manual imageries by the magic of makeup. 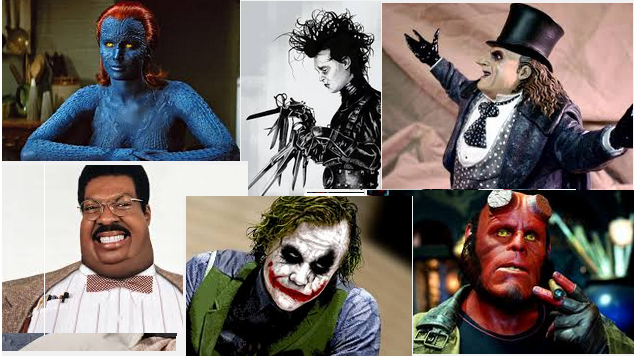 Here are some crazy makeover of movie characters. Jennifer Lawrence needed hours of time to cover all of her body with blue paint including her beautiful face to bring Mystique alive to reality. Edward Scissorhands was a great movie played by Johny Depp in 1990. As you can guess, that time there’ll be no hi-tech CGI to make his scissorhands move. Yes, the scissorhands were real. Eddie Murphy is one of a great comedy actor all the time and one of his movie deserves to be the best makeover. He became a fat professor by using prosthetic part of bodies attached to his body. Everything was great with his gestures. Most of comic hero characters are using costumes or having impossible parts of body. Different with Mystique, Hellboy was played by Ron Pelman and covered up his body by red paints plus two horns on his head. The Penguin is one of Batman’s main villains that has a unique body. He is not powerful but genius and smart. Batman Returns (1992) had to fight The Penguin, played by Danny DeVito, which tried to be the major of Gotham City. The Penguin outfit was quite simple but until you see his smile and you’ll understand why he gets one of the best makeover of movie characters. And now this crazy makeover to be a trends fashion like suicide squads halloween costumes. Up to you what choice you want movie costume.